It’s not a new technique. Layering textures on photos has been around for a long time. It’s an interesting effect that can take a documentary style photo and turn into a piece of fine art. The process isn’t too difficult. You’ll need some kind of image processing software… Photo Shop, Elements, Paint Shop or others. The software needs to be capable of working with layers. Open the image you want to work with. You’ll then open an image of the texture you want to apply. (Choosing the right texture for an image is the real art to the entire process). Place the texture on top of your photo as a layer. Adjust the opacity of the texture layer so the photo below it shows through. Your taste, goals and artistic vision will play a role in how much opacity you want. You may want to use an eraser tool to reduce or remove the amount of texture over key areas of your subject such as the face, eyes, etc. Once you’re satisfied flatten the image. At this point I find the image usually lacks a bit of “pop”… seems a bit flat and boring. I like to create a duplicate layer and select a mode such as “soft light” or “overlay.” Then, if necessary I adjust the opacity of this layer as needed to get the look I want. It’s really that simple. Below are a few photos I worked up recently using the process described. A Nice Surprise in the Mailbox! This morning I received an email from the folks over at Naturescapes.net, a very popular nature and wildlife photography forum. For the third time since May 15 one of my images I had posted in their galleries had been selected as an “Editor’s Pick.” There’s no great monetary reward, no trophies or ribbons, but it still feels like an honor to have your work recognized. Considering the volume of work posted in the Naturescapes galleries and the caliber of much of their membership I feel honored, surprised and a bit lucky. Below are the three photos chosen over the last 30 or so days. 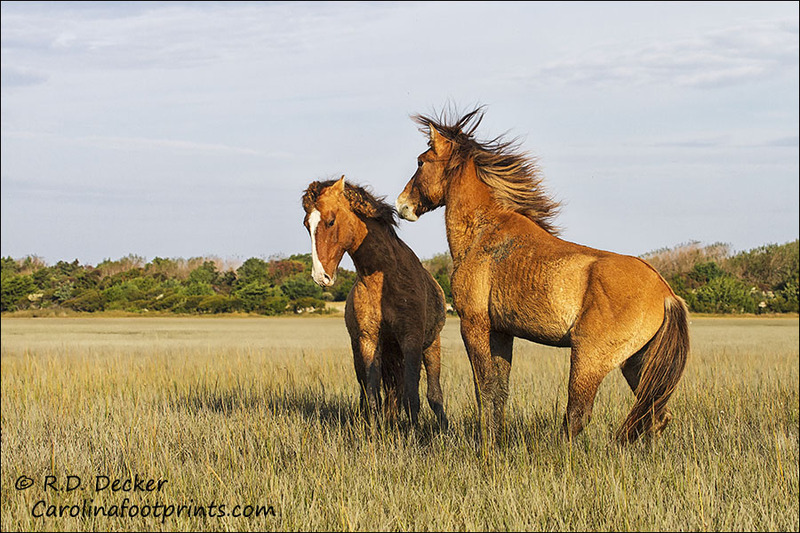 Just posted, fall dates for the Crystal Coast Wild Horse Photo Safari and for an exciting new Wild Horse Photography Workshop. The Workshop includes classroom instruction, a critique session and visits to the wild horses via a private charter each of the three days. As always lunch is on me for all three days. For the Fall version of the Crystal Coast Photo Safari instead of a morning walking tour on the final day we’ll be using a private charter. 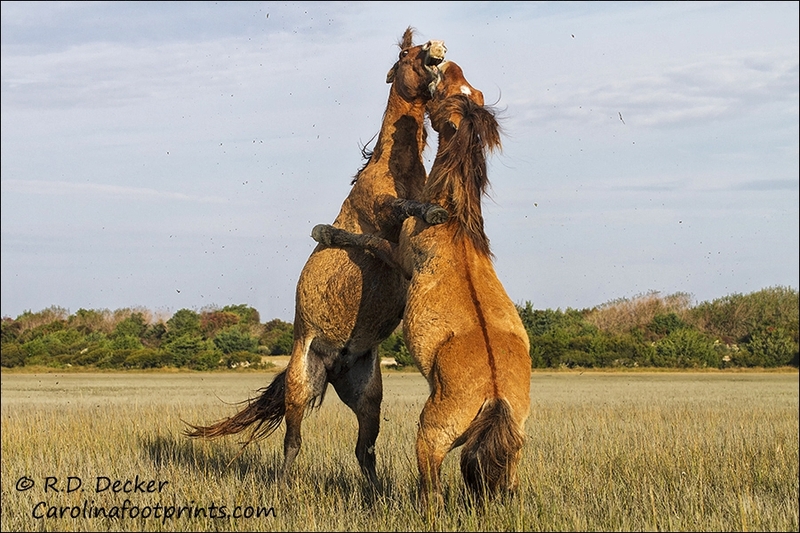 Both of these are great opportunities to observe, photograph and learn about the local wild horses. Check out my workshop page for more information. There’s something special about black & white. I simply love a well done black & white image. When I shoot I always spend some time looking for potential black & white images… I shoot for it. Granted, sometimes it’s just a happy accident that an image works well in this traditional monotone format. But many times it was the result of planning. 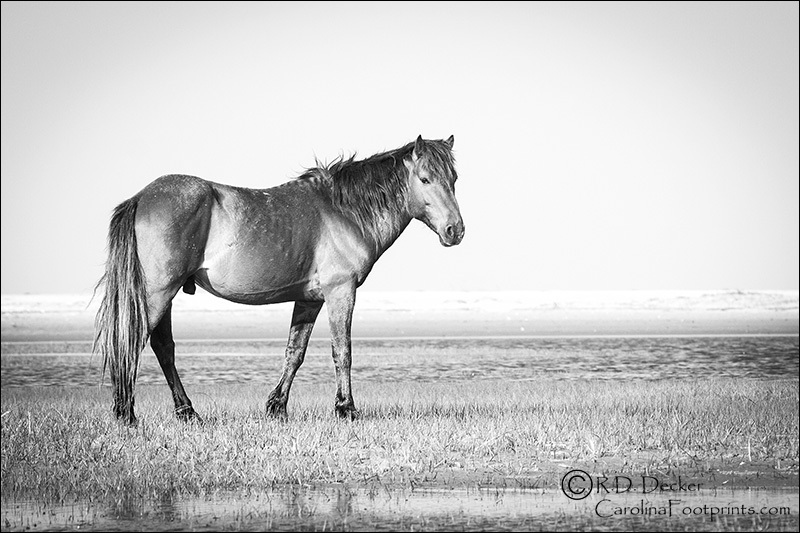 Below are a few Black & White shots from the May Crystal Coast Wild Horse Safari. (Be sure to check back for fall dates which are to be announced soon!). 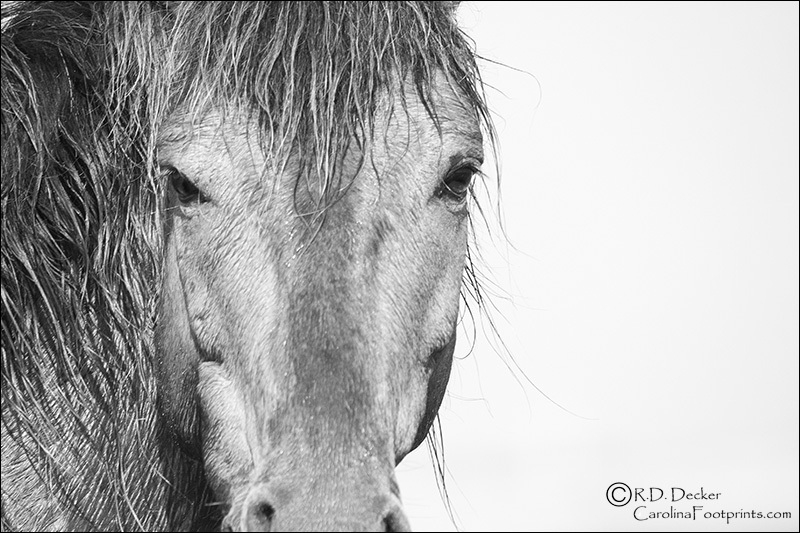 Those of us who spend a large portion of our lives photographing horses living wild and free are always concerned that our images may encourage undesirable interactions between these animals and people visiting them. 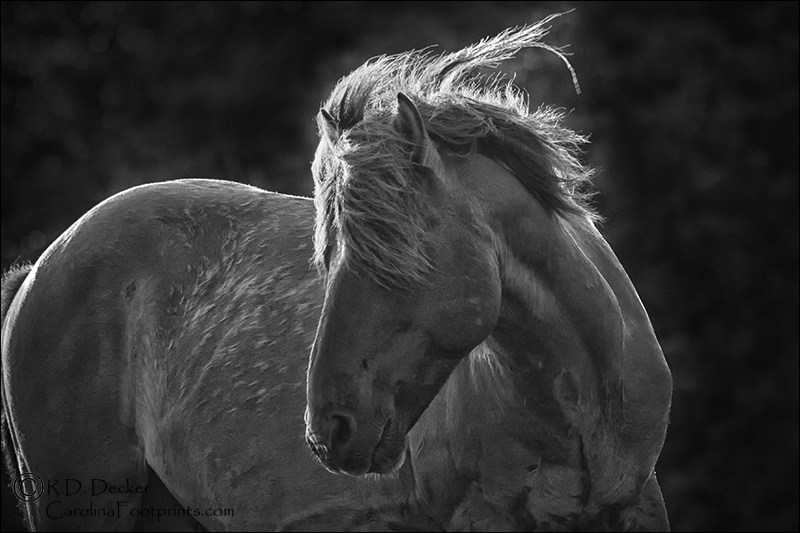 I’ve had the pleasure to spend a bit of time with some very talented photographers with wild horses as a primary subject. It really doesn’t matter whether they photograph the animals living in the western United States, Iceland or Argentina, these artists know their subjects well. They understand when a horse is “on alarm,” “profiling” or “stressed.” They recognize the body language used by these animals and know what to expect based on what they see. Each of these photographers is careful to not put the animal or them self at risk. Many if not most people see photographs as glimpses of truth… a realistic documentation of what transpires in front of the lens. What they fail to understand is that the world seen through the camera lens is distorted. 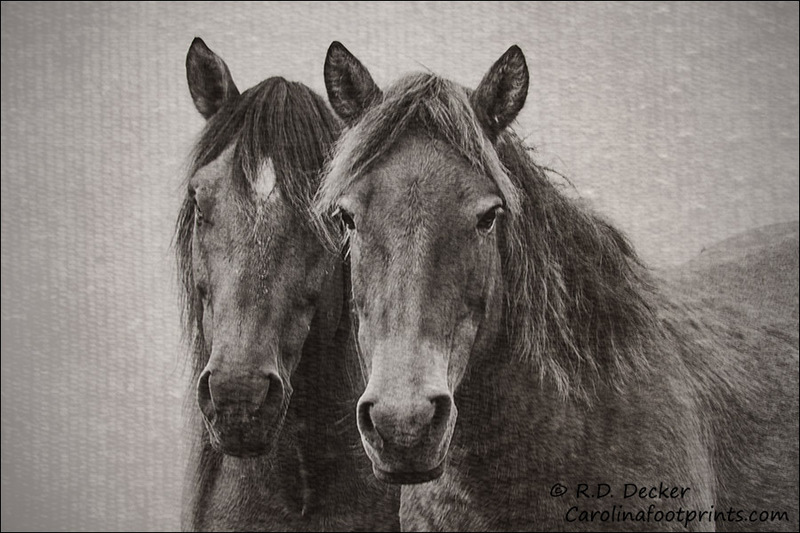 Telephoto lenses, the lens choice of wild horse photographers, tend to compress distant objects included in the photograph, making them appear much closer to subjects in the foreground than they really are. For example, an image of a nature photographer with a wild horse in the background may make it appear that the animal is nearer the human that it actually was. How distances appear are very dependent upon the perspective of the lens used, the position of the photographer as well as a number of other factors. It is difficult to accurately estimate distance in a two-dimensional photograph. 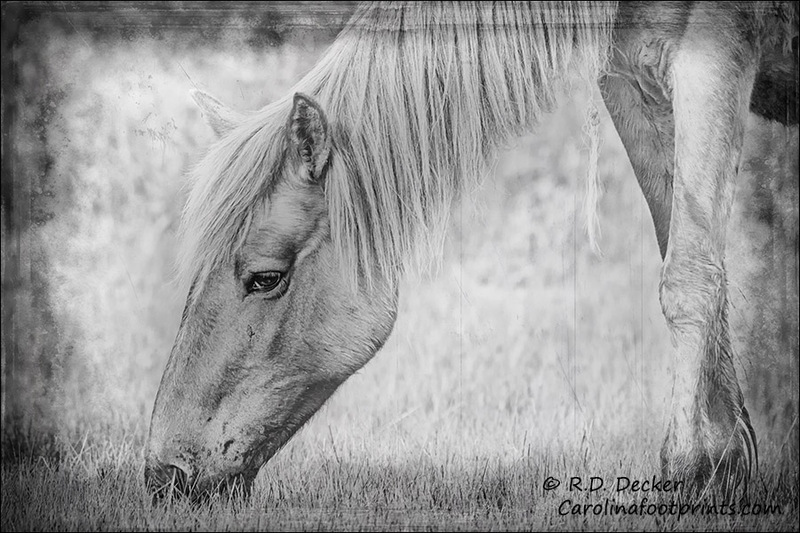 Telephoto lenses are also used by photographers to make intimate portraits of horses from safe distances. (The images below are examples of this.) To make a similar image a tourist using a cell phone or simple point and shoot camera would have to get well inside the animals personal space. That’s a recipe for disaster. Viewers also need to keep in mind that the finished photo you see is not a simple copy of what was recorded by the camera. Photographers use software to crop, and enhance their photos. They take a raw image and shape into the artistic vision in their mind. That process can also result in an image appearing to have been taken from a shorter distance than it actually was. In fact if you check-out most serious photographers smart phones you’ll find they even have apps installed to enhance, crop and zoom on images taken with the phones. When you look at a photograph what you see is an artist’s vision, not a slice of reality. 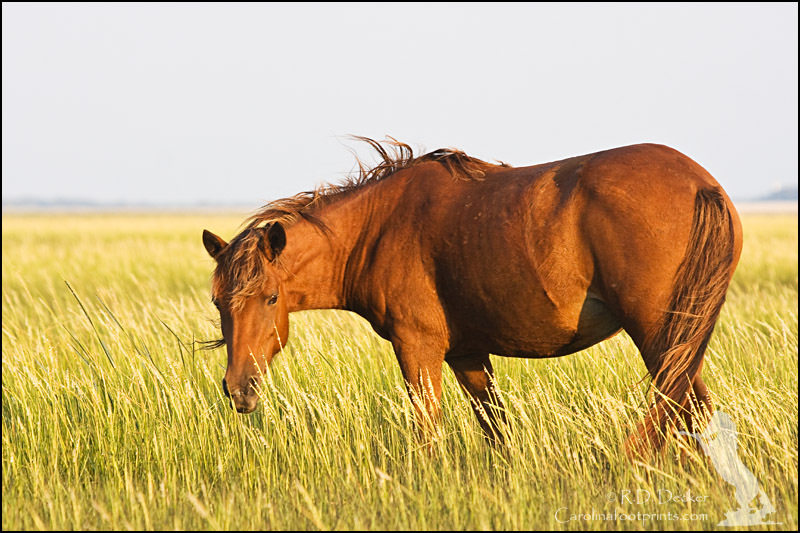 There are some pretty simple rules to following when visiting the wild horses living within the boundaries of the Rachel Carson Estuarine Reserve and the Cape Lookout National Seashore. In fact violating those rules can result in a ticket, fine and possibly even jail time. Perhaps more importantly, failing to follow these rules could result in serious injury or even death being inflicted by one of these beautiful but powerful animals. It’s important to remember these horses live a wild life, they are not tame pets. Even domestic horses can be dangerous for folks that don’t know how to properly behave around them! 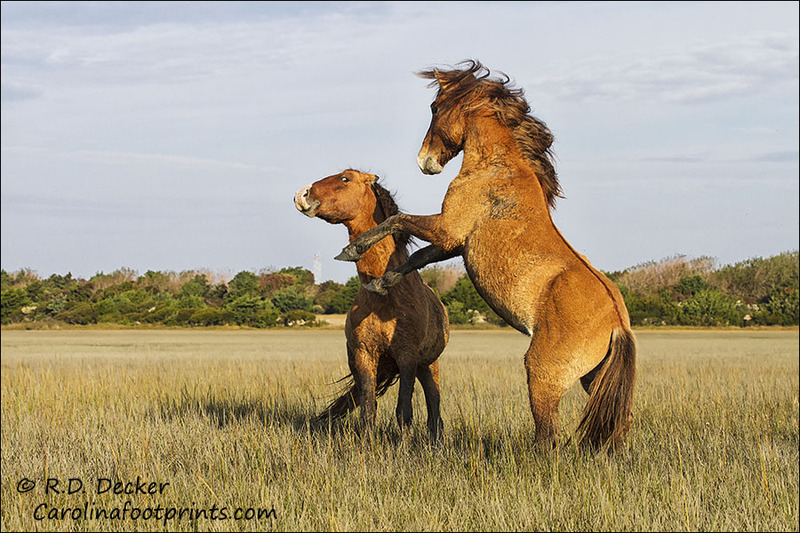 When visiting the wild horses do not approach closer than within 50 feet of them. If you’re not sure of what that distance looks like simply envision a full=length school bus. There will be times when the horses might approach closer to you than you’re allowed to approach them. If they do so move away slowly if possible. In some instances it may not be possible to move away. When that happens simply remain calm and still until you are able to slip back to an acceptable distance. Under no circumstances should you ever feed one of these animals. While you may think you’re being nice by offering the animal a treat the food you give the horse may actually be harmful to it. There is never a situation where touching or petting one of these animals. A course can go from calm and peaceful to a 1000 pounds of rapidly moving danger in the blink of an eye. They can bite, stomp and kick ferociously. Don’t do things to try and make the horses run. They get all the exercise they need on their own. Forcing them to burn-up energy reserves only places their health at risk. Observing horses in the wild is a wonderful experience. All I’m asking is that you be respectful and use a bit of common sense when visiting these amazing animals. Wild Horses Couldn’t Drag Me Away… I’d Go Willingly! That line by the Rolling Stones frequently runs through my mind when I’m visiting the wild mustangs living here on the Crystal Coast. I always loved that song. It’s one of the few that I can actually remember the first time I heard it… (and the young lady that introduced it to me!) But in the case of visiting, observing and photographing these animals they don’t have to drag me away. I’m more than willing to go on my own. Here’s a few more shots from last week. 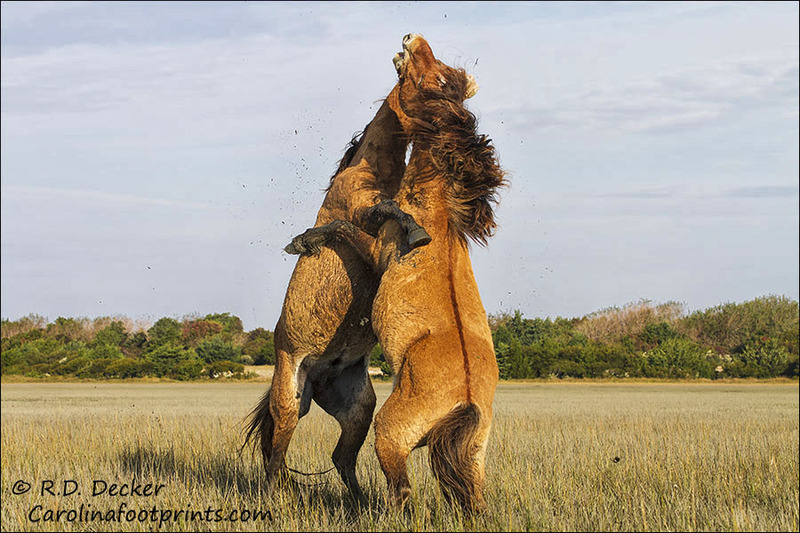 All Shackleford Banks Mustangs in this series. 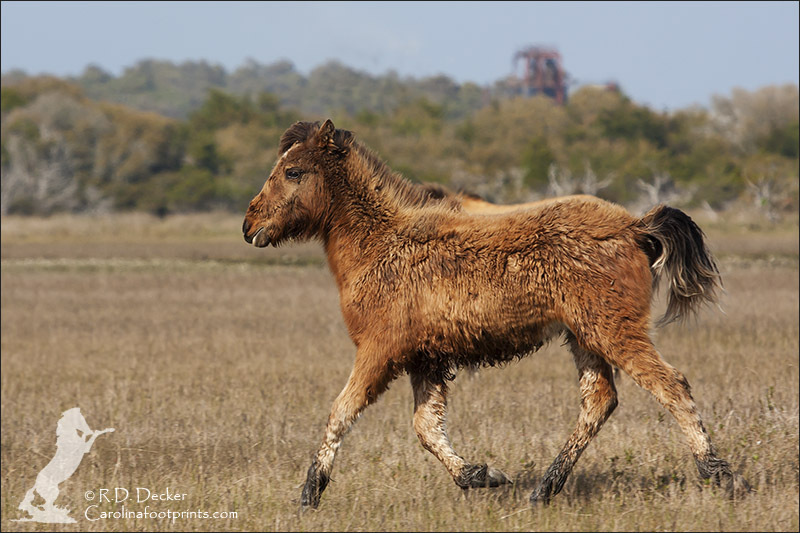 Unquestionably one of the most iconic images for the wild horses of the Cape Lookout National Seashore, finding an angle that will permit a photographer to include the lighthouse in the background of a wild mustang photo is actually fairly rare. 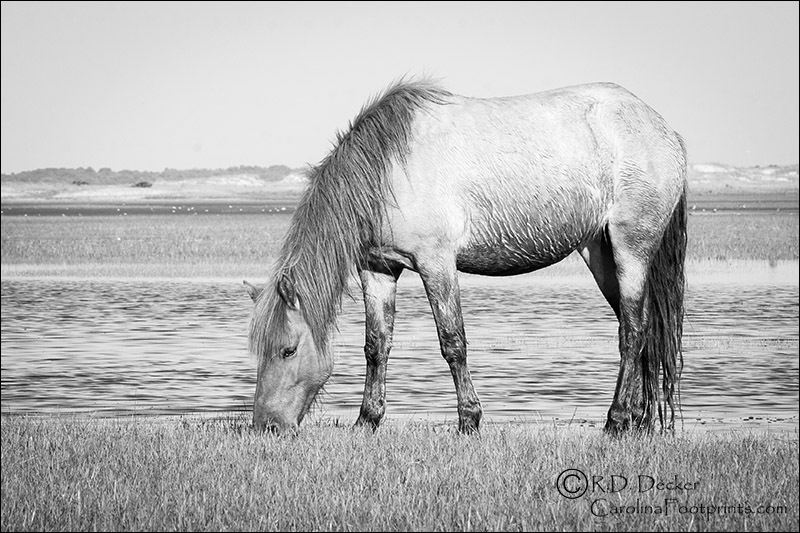 The odds improve when the horses are out on one of the marsh islands and you’re using a private charter to reach the horses, as was the case on the second day of the Crystal Coast Wild Horse Photo Safari last week. Hopefully we’ll get a repeat opportunity during next month’s tour which, by the way, still has limited space available (). 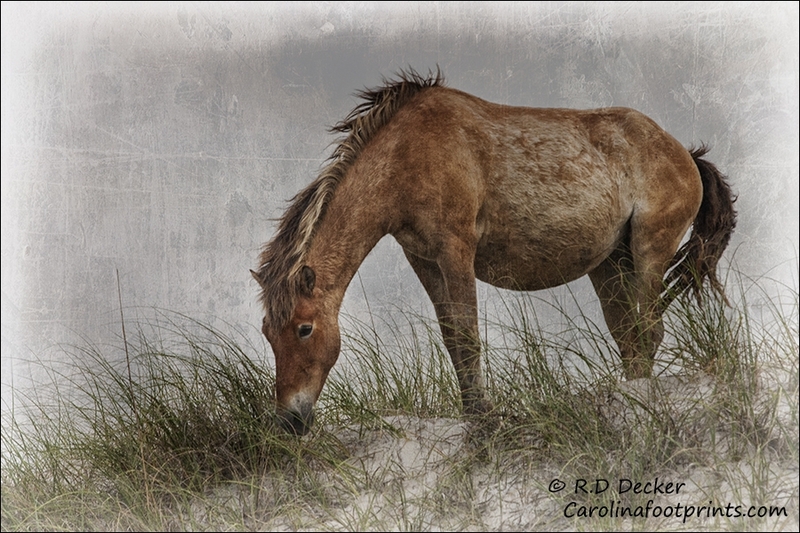 Here are a couple of shots of a wild horse with the Cape Lookout Light in the background. 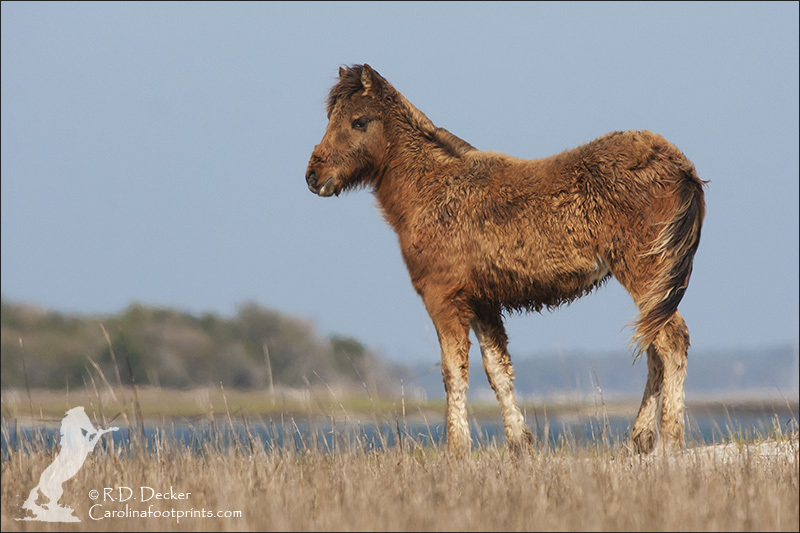 During last weeks Crystal Coast Wild Horse Photo Safari we were fortunate to be able to spend a bit of time with some youngsters. 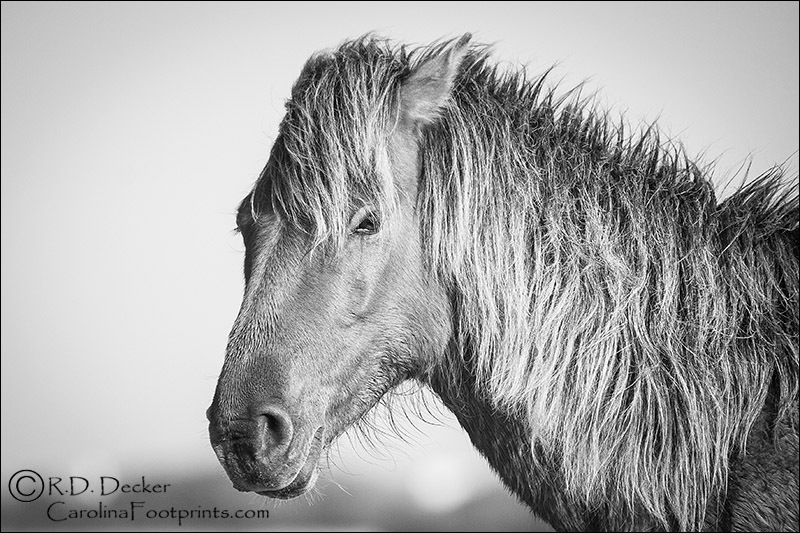 On Shackleford Banks we encountered a young mustang with a distinctive black star on its forehead. Over at the Rachel Carson Estuarine Reserve we were able to locate the newest member of the herd. If you scroll back a bit you can find a post with images of her and her mother a few days after her birth. 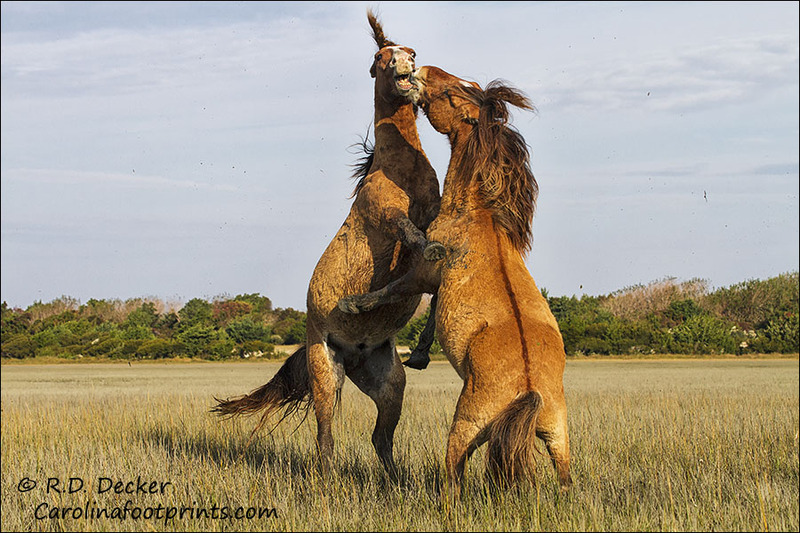 If anyone’s interested there is still a spot or two available in next month’s wild horse photo safari. I’d love to have you join us! 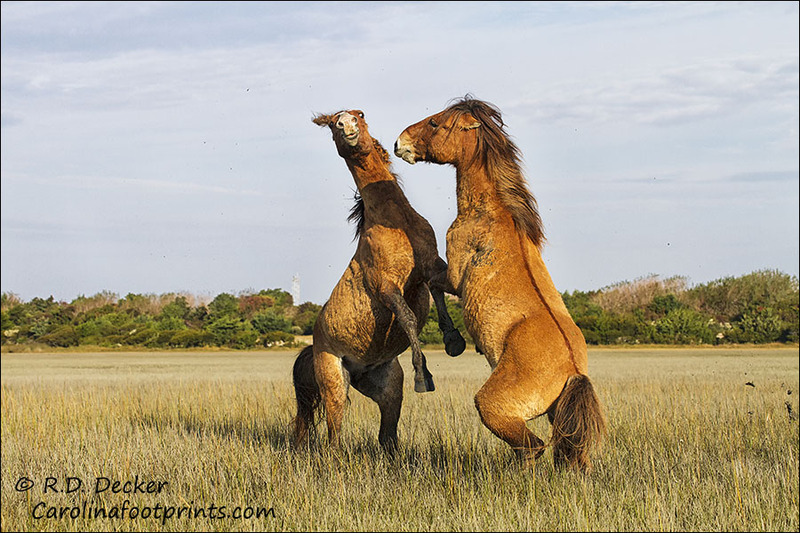 We enjoyed some great photographic opportunities, lots of action and some great conditions for the April 2013 Crystal Coast Wild Horse Photo Safari. A simple three word descriptive might be “fog, foals and fights!” We started the first morning with a bit of fog cover which certainly added a nice tough of ambiance to our photos. 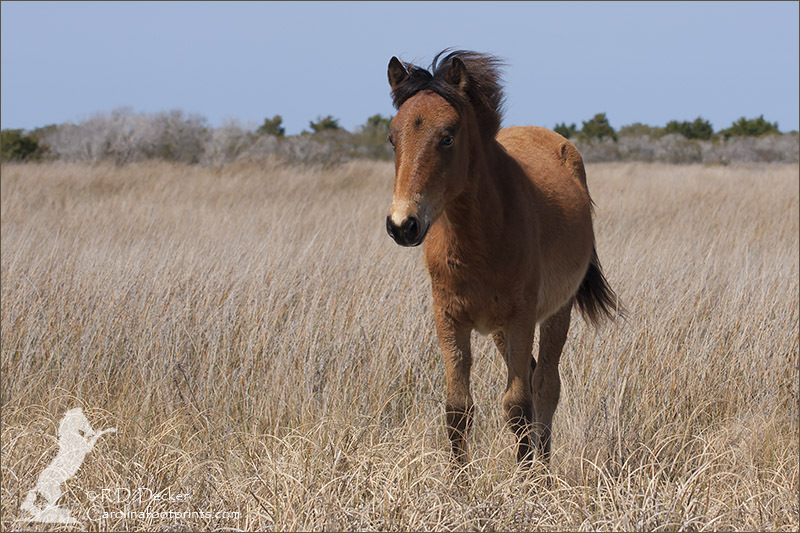 We got shots of foals both at the Rachel Carson Reserve and on Shackleford Banks. Everyone also got to observe and photographs a few horse fights. It was certainly a good outing. 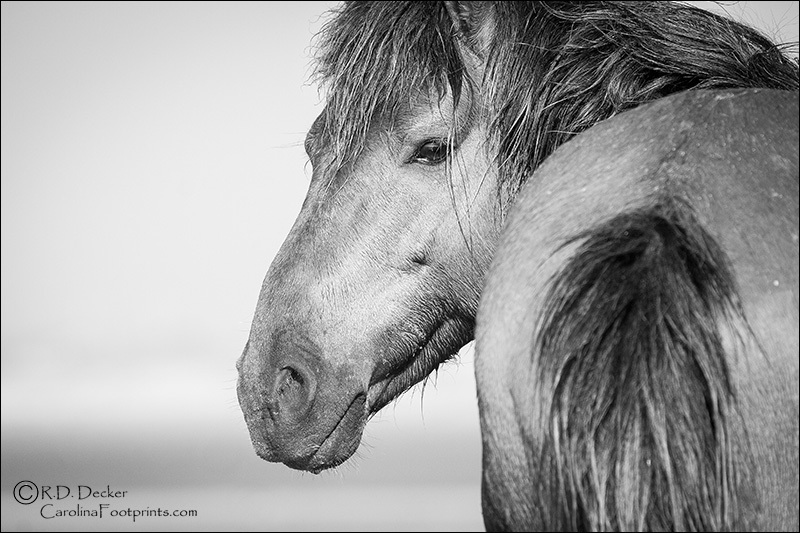 It’s going to take a while to sort through and process all the images so I thought for a first post about the Photo Safari I’d start with a few shots that include some of the participants working with the wild horses.